Portland has an iconic intimate concert venue called the Crystal Ballroom. Last night I surprised my wife with tickets to see one of her favourite bands, Switchfoot play the venue. Paper Tongue opened for them. Paper Tongue is a brand new band out of North Carolina. Young and full of energy, they played a five piece opening set that pleasantly surprised the Portland audience. It was difficult to hear the lyrics on the Mezzanine level where Shell and I sat but they sounded good enough for me to go buy their EP. I hope this seven member band finds an audience. When Switchfoot took the stage everyone was looking for Jon. A spotlight finally found him half way back in the audience singing the opening to the first track to their new album, Hello Hurricane -- "the world begins with newborn skin..." This ten-year veteran band knows how to tell a story with their music. The word pictures they create are plaintively beautiful. Though I've appreciated Switchfoot, they have never been a band I'd choose to have on my ipod. That will change after last night. For my money, Hello Hurricane is their best release yet. Now Shell and I can enjoy them together. As a matter of fact we're listening to them together right now. Portland has a new radio station: 105.9 FM "The Brew" has begun broadcasting 10,000 songs in a row to get a kick start. Today I heard songs from Styx, Bad Company, AC/DC, G&R, Aerosmith, REO Speedwagon, Bryan Adams, Journey, Quiet Riot, Billy Squier, Genesis, Whitesnake, Pat Benetar, Van Halen... all commercial free in the course of just over an hour without even a DJ to interrupt. I promptly got on the phone and called my friends. I could have designed this station. Sometimes I might need more musical diversity but wow, talk about comfort music. This is it for me. Today Shell and I had no kids, a bunch of errands, and a bunch of housework to accomplish. We did good. Though we didn't get as far as we wanted we are happy with what we did accomplish. This evening we had tickets to see the musical, Wicked. To get there we had to get cleaned up, get a meal and get downtown in 1 hr and 5 minutes. Than Thao is one of our favourite restaurants and lays between us and the Keller Auditorium. I called Khan, the owner, and asked if he could have a plate of pad thai and house chow mein without mushrooms ready for us if we arrived in twenty minutes. He said it was easy to do and told us to come on over. We arrived and our food had just hit the table and we were immediately seated to eat. It is fantastic to have such a great relationship with one of the best restaurants in town. If you have never been to Than Thao than you are missing out. They have food for everyone -- it even became a favourite of our vegan kids. It is not simply that the food is delicious, though it is that, nor that the prices are some of the best in Portland, though they are, it is that the restaurant is casually excellent. Servers are friendly and helpful, facilities are kept clean. Service is fast. Drinks are good (they offer a full bar). And they are more than willing to take special requests and make them happen. I know no other restaurant anywhere that I can as wholeheartedly recomend like I recomend Than Thao. So stop in sometime and check it out. Anyway, while not feeling rushed, we were out of the restaurant and on our way in under thrirty minutes. We made the show and it blew my gaskets. "Wow," is about the best descriptor I can give it. I knew nothing of the story going in. All I knew was it told the story of the Wicked Witch of the West from her point of view. Though it isn't quite accurate, I understand why it was given. I laughed hard and often, I was wowed by the voices, and the staging was great. Sometimes the sound mixing should have been better but that is a minor complaint. This is the second show we saw in the Broadway Across America series. We saw The Color Purple earlier this year and it also was a wonderful night, but this night was one for the ages. Nights like this happen once every decade or so. I think I'll add it to my gratitude list for the day. Our friend and my wonderful brother Larry passed away at 2:45 Sunday morning. My wife Kristin and I were with him, holding his hands and sitting in bed with him when his heart finally slowed to a stop. We spent this past week laughing, singing, and praying with him, and all the while he had us taking notes on new song ideas and instructions on how to continue his ministry and art. I'd like to push back the darkness with my bravest effort. There will be a funeral posted here on the website, in case some of you want to attend. We are not sure of the date when I will die. Goodbye, farewell, we will meet again. I saw the news in the Oregonian. A few days later as I put together a CD for some of my friends, two of Larry’s songs were included. A few days after that I sat with one of those friends listening to the CD I had burned for him. I didn’t think he’d know many of the artists. When Larry’s song, Lonely by Myself came on, he asked about it. I told him about Larry and the impact he played on my life. 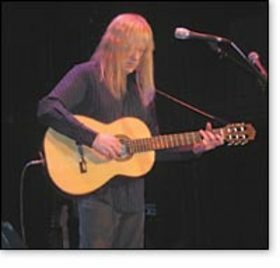 He then told me his Larry Norman story: Flying to Boise he sat next to this older guy with Long straggly graying yellow hair. As they talked Larry told him his story and gave him a CD. I skipped ahead to, Its Only Today that Counts. We listened in silence to Larry sing the Truth. My friend’s words were, “He was the nicest guy…” Larry moved my friend one step closer to Jesus. Larry, you had a habit of doing that. Your song, I am a Servant¸ was the song that got my attention and forced me to my knees, “letting Jesus know I wasn’t going to play games with him anymore…I was going to lay it all down and give up control.” When I’m pissed at the church for whatever I will often listen to Shot down. You may be singing in heaven’s choir now… My guess is that the amplifier does go to eleven up there and you’ll be jamming like you did back in the day, but the songs you left for us … the song that I heard God calling me through… the song that you wrote that played while kids steamed up the aisle in Scotland after hearing our God’s call…all the other songs which touched the addict, the outcast, or simply the rebel are going to keep playing in my heart, my mind, my soul and loudly on my stereo. For those I am grateful. Thank you. I won't fight the battle over music that my Mum fought with us. We used to hear, "That music is of the devil!" I want to yell at Radio Disney, "That music is aesthetically damaging to my kids! How bout some Guns and Roses?" My first Father's Day alone, my kids, then 5 & 2 really wanted to get me a gift and so I took them to the mall. They knew that I liked the Rolling Stones. I would sing "You can't always get what you want..." to them all the time...They hated it. But "Forty Licks" had just come out and so I sat right outside the door and sent them in with my money to purchase the double CD for me. They have been Stones fans ever since. A friend had two tickets to see Branford Marsalis and was kind enough to invite me. I forgot how much I love live jazz. It is an experience like no other. It invites you in and transports you to heaven or hell or wherever else you may choose to want to go. It breaks the rules and keeps them simultaneously. You don't simply listen to the music, you feel it. It enters into your body and baptizes you with emotion and feeling. It has the power to transport you to the place where your emotions live and let you visit for awhile. The free form expression of jazz is alive. In itself it almost breathes, especially when your conductor can play the sax like no other. In an hour and a half we heard 6 songs. "Hope" did exactly that. And the song by the old dead Englishman (the only song Brandford needed sheet music to) transported me to a place called memory lane. Everyone around me was similarly lost in their own created memories. We sat together and shared a common sonic experience that gave us each thousand of gifts -- no two of which were the same.